Kathmandu is still a great place. A lot of work is still be done to restore the damage caused by the earthquake, but the tourists are back, and some of the shopping area of Thamel have even been pedestrianised. The Pilgrim book shop, destroyed in a fire is now back up and running too, gear shops abound, with cheap versions of all the expensive labels. Domestic departures at Tribuvan was full of excited trekkers, and large groups of commercial expeditioners, towering over their sherpa guides, easily identified by their brand new expedition boots, and united only by their group tee shirts. Then there was us. Worn men with worn gear. This was the 25th anniversary of the successful first Irish Everest expedition, and the deputy leader of that group in 1993, Irish adventurer and mountaineer par excellance, Frank Nugent was our leader this trip. Paddy O’Brien, his partner in manys an Alpine and Arctic venture, Gerry Galligan the IMC’s most prolific expeditioner, and myself, made up the party. The Lukla flight is great, (if you can ignore the fact that it is supposed to be the most dangerous on the planet), and soon you have landed and reclaimed all your gear. Most of ours had gone on the previous days flight. There followed two days uphill struggle through the crowds of trekkers to Namche, which is now sporting numerous cafes, expensive gear shops and even an Irish Bar (god help us). The amazing load carriers are still there, still gobsmacking the visitors, but now they are on mobile phones. We had to visit the national park office to sign documents to agree to take out everything we took in. Over tea, the official told us that there were 25 expeditions on Everest, two on Lohtse and one on Nupse. Our rubbish would be weighed back in Namche, and it would cost us 400 Rupees per Kilo to recycle. Good for them. Two days later we were camped at the back of a house in the, almost deserted, high village of Mende, preparing ourselves for an 850m climb to Kyajo Ri base camp, while our Sirdar Dhana ( also from 1993) got directions from the lady of the house, as to where the path went. It was tough, (and a lot harder for our porters), but we got there, with Paddy first and then me, to find a couple of tents belonging to a Russian Kyajo Ri expedition. The three porters had been there a few days, and were cold and miserable in the low cloud. Our 9 porters romped in and soon we had base camp up and running. The Russians returned that evening and dismantled their camp, disappointed that they had not reached the summit due to deep snow. The leader was Yuri Somethinchenko, winner of the Piolet d’Or, and summitteer of many 8000m peaks. BC Day 1.The next day was sunny and beautiful, and although it was supposed to be for rest and acclimatisation, three of us decided to carry loads up to the bottom of the gully above. When we got there, we could see the Russian fixed ropes up the cliffs above, so we went up for a look, eventually going up them and continuing to the snowy valley above, the proposed site of ABC at 5000m. I was up first , then Gerry then Paddy, who was suddenly struggling with the altitude. Frank had stayed below to rest. BC Day 2. In the morning Paddy was ill, and Gerry and I did another load carry to ABC with the porters, we put my tent up and came down. BC Day 4. Paddy went down to Namche to seek medical help, while Frank, Gerry and myself moved to ABC. I was up first and put the kettle on for the others, but only Gerry arrived, telling me that Frank didnt feel he had the strength to make it. Now there were 2. That evening I broke trail up the hill above ABC in soft snow to see if I could see a feasible route. Higher up, I ran into very deep snow, but could see a possible route to a col, from where the ridge looked do-able. The summit ‘Crown’ was another matter. We needed to start early while the snow was frozen, that was it! ABC Day 1. Early start was 5.00 AM. It was brutally cold and my hands were numb from trying to boil the kettle from lumps of ice. The tracks from the previous evening were much easier being frozen, but the deeper snow above had only the crust frozen, so we stood up on it, only for it to collapse, and then we had to climb out, pulling our feet out through the crust,only for it to collapse again. My estimated time to the col of about an hour and a half was eaten up in a couple of hundred metres. Exhausted, we had to come up with a plan B. A traverse to the right would take us to a short climb to the top of the big rock tower which dominated our base camp. We felt that we could have a rethink, and try again tomorrow, but lets get something in the bag. Floundering our way across a boulderfield (‘ a la Fairhead’ only covered in deep powder) we got to the base of the West Pillar, where upward progress was mindset V gravity, but we made it to the bright side where the snow had melted, and it was easy to the top of this huge rock monolith. “Oh look, there’s Frank leaving base camp”! The views were immense, but Phuletate still looked like, well anything but a foregone conclusion. Care was required on the descent, but on reaching ABC we met Frank who was delighted (and relieved) to see us. He advised us that the porters were anxious to leave, but we had another day at ABC. He descended to BC, and we spent the snowy/cloudy afternoon in the tent. ABC Day 2. Sunshine and euphoria as usual, but let’s pack up before it snows (and it did) about 10.00 AM. we decided to take a walk up through the misty Kyajo Ri valley for a few hours. On the way down we came across Yeti Tracks, which Gerry wanted to follow across a frozen lake (to rule out a snow leopard you understand). The thought of following a snow leopard or yeti, in fog, across thin ice did not particularly appeal to me, and fortunately I was able to remind Gerry of his redunancy package, so we went back to ABC. Plain sailing to BC one might have thought, but not so, alas. as thick, driving snow made finding the top of the Russian fixed ropes problematic. We made it ‘heroically’ to base camp early afternoon with big packs, but to our amazement, and awe, the porters decided to go up that evening and retreive the rest of the stuff ( ABC having been equipped for 4 for three days), which they did fairly effortlessly as the weather had cleared, and being very keen to be back in the comforts of Namche, I would imagine. BC Day 5. Exodus. We left with all we could carry, wondering how on earth the small group of porters would manage to divide the mountain of stuff we had left. They overtook us, with much good humour and laughter before the monastry above Mende. The remainder is about a days rest and overindulgence in Namche. and 3 days descent and ascent to Pulele for a function ( the second day was 8 hours of the ‘path from hell’ ( this drizzly’ La ‘was 30% rock. 30% slime, 30% horseshit, and 10% horsepiss). We were received royally at the Irish Nepal Education Trust school in Pulele, in time for the school prizegiving (a type of event in which I had never been previously involved for some reason)which went on for some hours. Largely compared by Dhana (who had left our expedition early), and involved our chief guest Dawson Stelfox, with Margaret Stelfox , Chris Avison and Mary Solan. Even I was asked to present one of the school prizes. My grasp of Nepali is rudimentary, but I think it was for truancy. The euphoric evening of culture dancing and music, ended on a downer when our porters gave our tips back, which they must have considered derisory. 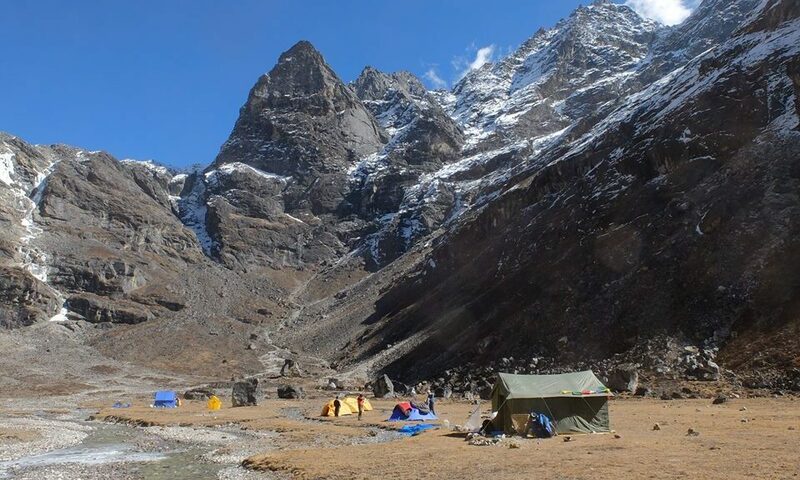 Red faces and a futher donation may have helped, but expectations are different, especially in the Khumbu, where a recent group of Hong Kong businessmen tipped our porters $300 each. The short trek to the road head was wonderful, unspoiled Himalaya, but the 4 + hour jeep trip to ?? as tough a test to vehicle and driver as I have ever experienced, and our accommodation by the airport was probably also the most unsavoury, but the flight back to Katmandhu a delight, as ever. As I write this report I am listening to a CD of Nepali music. After a fine indian meal in the Third Eye Restaurant in Thamel, where I informed the head waiter that my last meal here was in 1994 (the year before his birth apparently) we went to a bar where there was a live Nepali loyalist band ( 5 drummers and one musician). We applauded wildly, -perhaps too enthusiastically, thus the CD.